I think I’m going to have the chiropractor look at JR. He’s forward and willing, but he seems a little tight in his back. He’s getting goosier during grooming and feels a little tender through the loin. I’ve felt it since I started riding him and it’s not going away. I thought back to what I did for Wizard when we were first starting out, and he had two chiropractic/acupuncture treatments. It would only be fair of me to get JR aligned, especially since he’s already doing more demanding work with cantering and a little bit of trot poles. He’s a healthy and sound horse and I want to give him every advantage I can afford. Our ride was good. I longed JR for about ten minutes. He was feeling a little fresh and did one or two little bucks and broke into a canter, although I only wanted a working trot. I usually only ask for a canter on the longe in very small quantities, more for balance and training than any sort of exercise. I prefer to do most longe work at the walk and trot, especially with green horses. I rode for about 15 minutes and we did about 10 minutes of relaxing trot work. Unlike our last lesson, I mostly worked on “long and low”. JR has the habit of bracing with the bottom of his neck during transitions so I’m trying to work and stretch the muscles in the top of the neck and not let him brace the muscles in the bottom of his neck. It went well- I got a few nice stretches out of him and we did a baby shoulder in at the walk in each direction. I also set up the ground pole box (four jump poles in a square) and we did a little work on halts and disengaging the hind end. He’s wiggly at the trot and he’s heavier in my hands, but I think it’s his greenness and his build. When he’s more schooled, I expect him to take more contact than his friend Wizard. Speaking of Wizard… breakthrough, breakthrough, breakthrough! I was on Cloud Nine after our ride tonight. 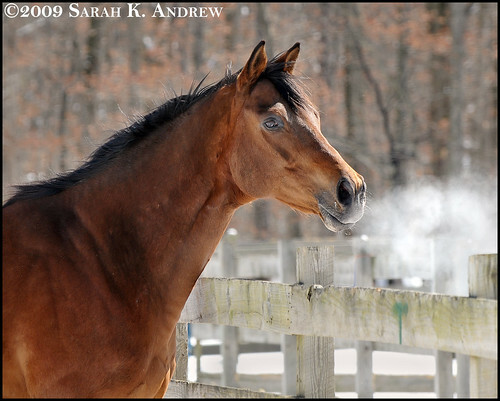 I longed him for ten minutes to let him warm up- he did that wonderful working horse snort… not the purr of a jumper, but the rhythmic snort of a fresh horse ready for work. Under saddle, his walk was relaxed and willing. He chewed his bit slowly and thoughtfully, not nervously. I kept him on a large circle for our ride. I started on his hard side (right) with trot work. The transitions were the most harmonious yet! There was very little awkwardness and we got in sync really quickly. Wizard picked up a little bend when asked and did some amazing stretches. A few hints of long and low, on our way to the coveted dressage stretchy circle. We trotted left as well with the same results. It might not have looked like a lot, but Wizard had a major breakthrough and it was thrilling. All of a sudden, things are falling into place. These are basic movements, but they were not possible without all of this careful riding and care for his health. I gave him Ulcergard and I’m still trying to figure out if it’s the magic bullet. If it is, it’s a pricey magic bullet ;^) Two of my barn buddies have confirmed my thoughts that Wizard looks like a new man- his belly is gone and his muscles are getting smooth and round. Wizard is a natural-born mellow and willing guy. He is eager to please and it is very rewarding to find the real horse as a result of all our hard work. I was getting close to giving him another long layoff, but the extra time and money have really paid off. Go Wizard!!! Looks like you’ll have some gorgeous days this week for riding. Yes, we’re getting some prime riding days right now in NJ. Hope you’re enjoying the weather as well.